Flour, water, yeast, and other ingredients are mixed together in 1,000 pound batches in our Shaffer horizontal mixer. Flour is placed into the mixer from above. 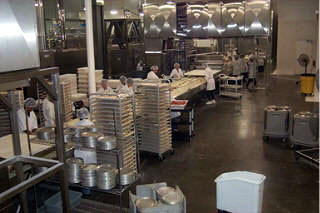 The dough is then placed into carts and transferred to the divider/rounders.. The secret to making gourmet quality dough is the ingredients (flour, sugars, oils) and the time and conditions maintained to allow the yeast to activate and rise. This process, called "proofing" is what gives all bread products their unique texture, body, and taste. 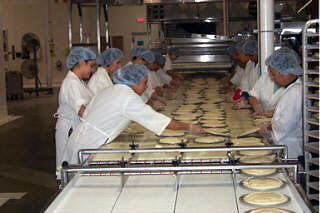 At San Francisco Foods our dough is proofed twice for a light but firm texture. 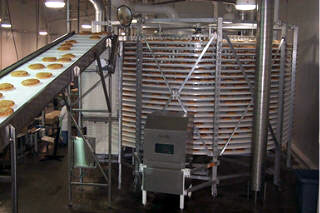 After intermediate proofing, the dough balls are dropped onto a "cross sheeter" that flattens the dough into the traditional flat round shape. The dough is hand stretched over aluminum pans and topped with sauce and high quality ingredients as shown in these pictures. The topping line is 4ft. wide by 96ft long. 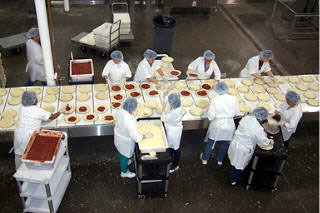 The topping line holds 384 pizzas. When the entire system is full there are 6,734 pizzas in process. For stuffed pizzas, a second piece of dough is added as the top crust. 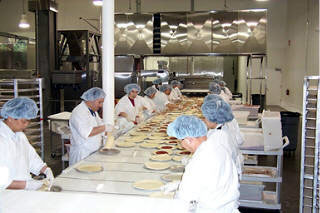 (Right): Pizzas and calzones are "hand crimped" shut sealing in the flavor. Then each unit is inspected for a perfect crimp. (Lower Left): Now the final proofing begins. 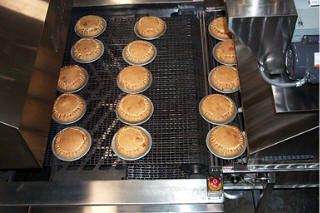 The product moves by conveyor to the spiral proofer that is temperature and humidity controlled to achieve a perfect rise in the dough. 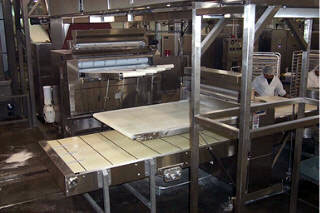 Most of our equipment is made out of stainless steel to allow daily wash downs and sanitation. 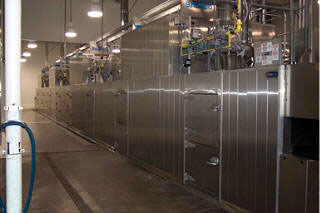 The entire plant is cleaned at the end of every production day and wiped down betwen product changes. 100ft Babbco impingement tunnel oven. Dual spiral proofer. 1,600ft of conveyor belting. Warm and humid for baking dough. Pizzas are par baked for 8 minutes at 420 degrees to achieve their golden brown color. Fresh baked pizzas straight out of the oven. 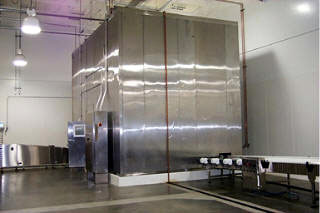 Nitrogen spiral freezer runs at -90F to quick freeze product in about 15 minutes. After freezing the product is packaged. 1200ft ambient air spiral cooler allows product to cool down. 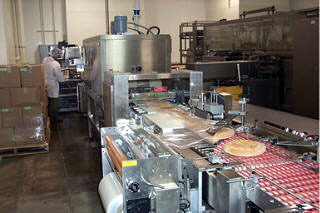 Shrink tunnel and two sided labeling machine can label 80 deli units a minute. 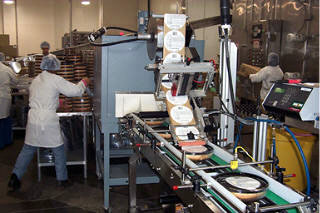 (Right) Shrink wrap system for boxed product. Automatic cartoning machine. This machine opens a box, inserts a pizza, and glues the box closed. 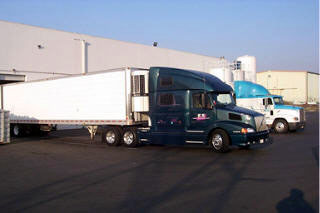 From our plant to your grocer our product is shipped frozen throughout the United States and Mexico. Thank you for joining us on our plant tour.